I imagine that if Disney ever opened a theme park in Las Vegas, it would almost certainly feature games like this one. I grew up going on family vacations to Vegas, and I can pretty much guarantee that if real slots games were as visually appealing as Dr. BoneJangles Slots, I would’ve ended up with a dangerous gambling habit before I was 10. 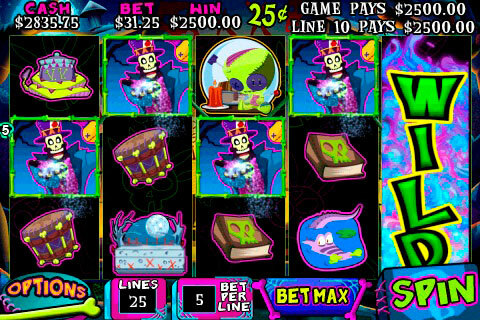 From Faro, previously of Armadillo Artie Slots fame, comes Dr. BoneJangles Slots, a voodoo-themed slots game that seems to take inspiration from The Princess and the Frog and Tim Burton films. Visually, the game is absolutely stunning, really and truly incredible. Seriously, Dr. BoneJangles has some of the best animation and art direction I’ve seen in any game of any genre. The brilliant cartoon graphics feel like classic cel-shaded Disney, and it totally blew my mind. They almost feel wasted on a novelty slots game like this one. The ordinary slots gameplay is almost a letdown when you’ve got so much eye candy around, but the game throws you enough extras to keep things interesting. This is a five-reel, 25-line video slots game, which means you have 25 different lines you can bet on, and if you make a match of three or more starting from the left, you win. In addition to the regular betting lines, there are expanding wilds which cover that entire reel, and Dr. BoneJangles will occasionally make an appearance to bring your reels back to life for a chance at more winnings. Get three voodoo dolls in any order, and you trigger a special Voodoo Bonus where you can win free games or extra cash. This isn’t a real slots game, so you’re just playing for fun, but it does give you casino-style odds, and you can adjust the denomination of the game to grow or shrink your winnings even faster. The Voodoo Bonus is especially nifty, as you get special cutscenes where you can interact with the doll as you try for the bonuses, but otherwise you’re just mechanically pressing the Spin button while your faux fortune increases or disappears. For an iPhone slots game, Dr. BoneJangles is fairly impressive, but it does make a slight misstep with the sound. While the music is very catchy and professional, it’s not well-suited to being started and stopped again every five seconds. Since sound is such an important aspect to keeping slots games satisfying, the choppy music in Dr. BoneJangles just feels off, but the other sound effects are swell, complete with Dr. BoneJangles’ deep, rich laughter. I was a little disappointed that there was no big jackpot to shoot for, and there are also no online leaderboards. Since shooting for a high score is really the only thing you can do in a game like this, I was expecting the developers to play up that aspect a bit more, but no dice. All the same, Dr. BoneJangles is a really beautiful piece of work. I wasn’t particularly impressed with how the slots game worked, but I still couldn’t take my eyes off of the screen. If you’re looking to bring a little Vegas or Atlantic City action into your day, look to the Louisiana Bayou and let Dr. BoneJangles work his voodoo magic on you instead. AppSafari review of Dr. BoneJangles Slots was written by Tracy Yonemoto on May 30th, 2010 and categorized under App Store, Featured, Fun, Games. Page viewed 6078 times, 5 so far today. Need help on using these apps? Please read the Help Page.